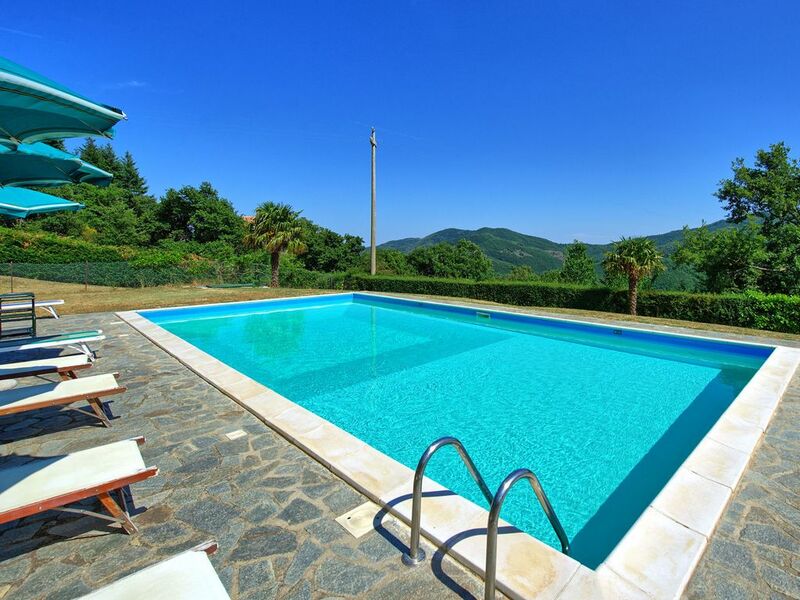 Beautiful property situated on the hills around Cortona, comprised of 4 living units which are not internally connected, they area rented together as a single rental. On the ground floor of one of the units, there is a large common area with a living room, dining area, kitchenette and toilet. The rental has various outdoor furnished areas with tables and chairs, a large swimming pool with a solarium and a games area with a volleyball net. Borgo Veronica guarantees privacy and tranquility and lies just 5 km from the small town of Portole where there are grocery shops and a restaurant. Available to guests: common room with lounge, dining area, kitchenette and toilet, swimming pool reserved for the exclusive use of guests (12 x 6 m – min. depth 1.20 m – max. depth 2.3 m), barbecue. The villa has Wi-Fi internet connection, insect screens on the windows and 2 baby’s cots. Parking available upon the property. Distances: Portole (food shops and restaurant) - 5 km, Cortona - 12 km, Camucia (train station) - 15 km, Castiglion Fiorentino - 24 km, Lago Trasimeno - 26 km, Arezzo - 41 km, Montepulciano - 50 km, Pienza - 56 km, Montalcino (home to the famous wine “Brunello di Montalcino”) - 75 km, Siena - 80 km, Orvieto - 100 km, Florence - 115 km, Rome - 215 km. Raised ground floor (accessed by climbing 4 steps): living room (TV) with fireplace and dining area with kitchenette (oven, freezer, dishwasher, toaster, microwave), double bedroom, bathroom with shower. Ground floor: living room with sofa bed (double size) and wood burning stove and dining area with kitchenette. First floor: double bedroom, bathroom with shower. 1 step higher: double bedroom, bathroom with bath and washing machine. Ground floor: living room with dining area and kitchenette (fridge-freezer) and wood burning stove, double bedroom with bathroom with shower. Ground floor: communal area with lounge, dining area and kitchenette (oven, fridge-freezer, dishwasher) and bathroom with shower. This place is great, I absolutely loved it! We wanted to be close to Cortona but also wanted to stay in the middle of the countryside, and that is what Borgo Veronica is. If you want peace and nature you should definitely come here! Borgo Veronica is the perfect place to enjoy some peaceful days in Tuscany. Very cosy, very clean place, beautiful view. Lot of privacy! Veronica was extremely helpful and nice. A good as it gets! Wir hatten einen wunderbaren Urlaub. Die Spielecke und das Volleyballnetzt haben gute Dienste geleistet und das Schwimmbad war traumhaft. Auch die Aufteilung in verschiedene. Apartments hat uns sehr gut gefallen, so konnte sich jeder jederzeit zurückziehen. Sehr zu empfehlen. Die Besitzerin war grossartig. Sehr schöner Frühjahresurlaub mit einer Gruppe von Freunden. Wir haben es genossen und empfehlen es weiter.